One of the most effective ways for celebrities and public figures to drive engagement on Facebook is by hosting question-and-answer sessions, and conversational marketing platform BumeBox -- a new partner in the social network’s Public Content Solutions program -- is making the launching and moderation of those Q&As easier via its social dashboard. 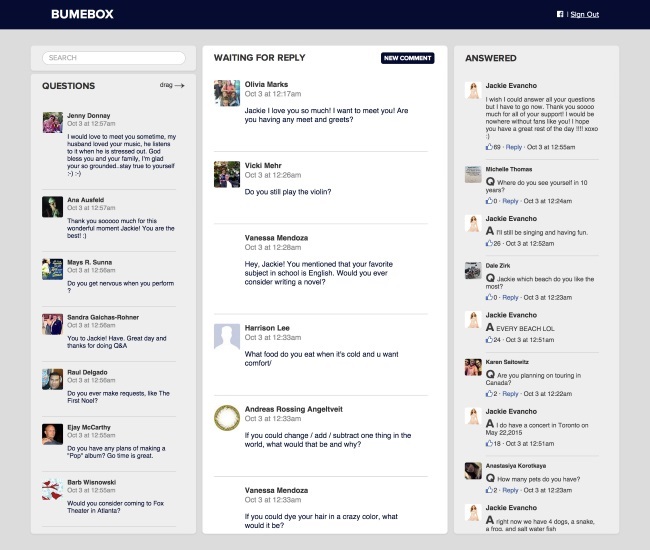 One of the most effective ways for celebrities and public figures to drive engagement on Facebook is by hosting question-and-answer sessions, and conversational marketing platform BumeBox — a new partner in the social network’s Public Content Solutions program — is making the launching and moderation of those Q&As easier via its social dashboard. The addition to the BumeBox social dashboard allows moderators of Q&As to easily view new questions, select those that will be answered to a queue and track questions and answers, allowing hosts to focus on answering the questions in their queues. Facebook Public Content Solutions manager Bob Morgan and public content manager Vadim Lavrusik said in a post on the Facebook Media blog that singer Jackie Evancho hosted a Q&A using BumeBox’s social dashboard, and more than 1,500 users submitted questions, resulting in the daily like growth on her page more than doubling versus the page’s average daily like growth. We believe when executed properly, Facebook Q&A is the most authentic way celebrities can connect with fans, especially around media projects they are involved with including television, music, sports, entertainment and politics. Fans are less likely to drop out of a compelling Facebook Q&A with a consistent flow of interesting answers. We work hard to facilitate this type of experience. Readers: Have you ever participated in a Facebook Q&A?